Clara arrived fashionably late, one day past her due date. I was pretty sure I would go the full 40 weeks with the second, so I felt only a mild twinge of anxiety when Gerald wanted to go see Andy Pettitte's number retired at Yankee Stadium. 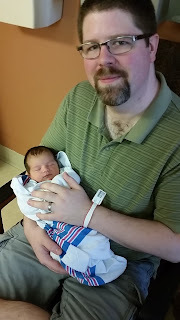 I was a week away from my due date...and really, what were the odds? 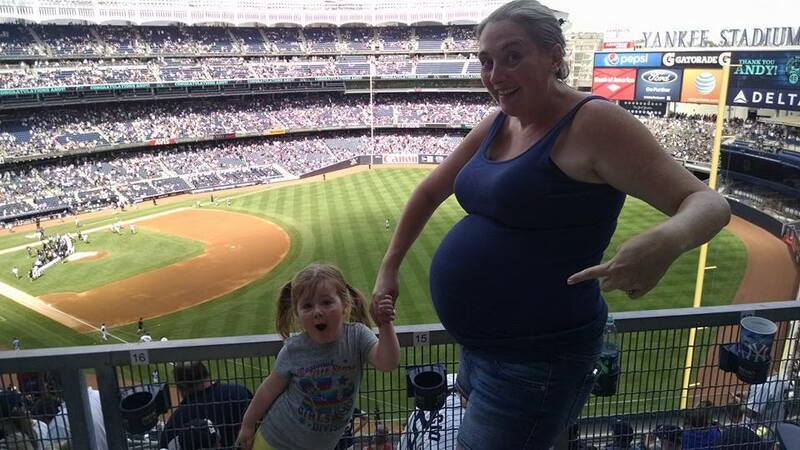 I made a joke on the way to the train that if I went into labor at Yankee stadium, our TBD little girl was going to be the first female Major League baseball player. Gerald bought tickets and we headed to the stadium on the subway. Before the fateful "water break." Freya already planning her jail-break. We had only planned to stay for about 4 innings anyway. Clara can last only so long, even distracted as she was by pizza and ice cream. Gerald suggested packing up to leave and I excused myself to use the restroom for the hundredth time (thanks to the baby using my bladder as a pillow and punching bag.) Except, when I stood up, it felt like I wet my pants. (embarrassing) I quickly waddled to the bathroom. It wasn't pee. 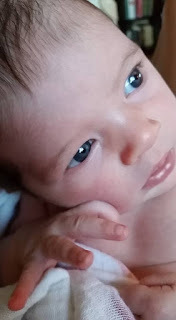 My water had broken, which along with about fifty other pregnancy symptoms I had been experiencing with this pregnancy, hadn't happened when I was pregnant with Clara. I hurried back to Gerald and Clara and told him the news. Gerald, with an excellent poker face, said: "Well, let's get going." The people in the row in front of us heard, cheered loudly, and suggested we name her Andy. In the lobby of the stadium I suggested asking guest services to help us get a car service to the hospital. But the words: "my wife's water broke" incurred a frenzy of activity. Soon we had an entourage of 2 EMT's and a police officer. No, I couldn't walk - they would get me a wheelchair. And a car service was out of the question - we would ride in style in an ambulance. To be fair, Gerald and I both expected this labor to be pretty quick. Common wisdom proclaims that your second labor will be about half as long as the first. Clara's was six hours so we assumed we had to get moving. They wheeled me over to first aid to wait for the ambulance to arrive. 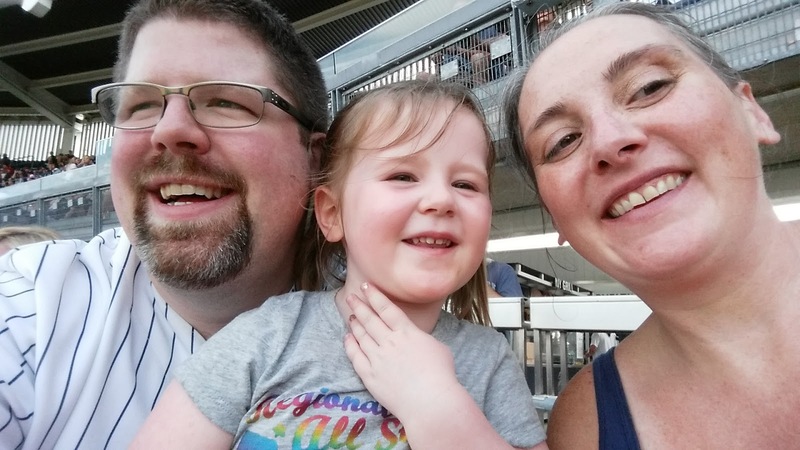 Family was called, and my sister and mother planned to meet us at the hospital to take Clara home, and Gerald's parents hopped in their car to come down to the city and stay overnight with Clara. An absolutely lovely police officer whose name I can't recall (edit: Gerald remembers: Officer Vanessa De Los Santos) stayed with us while we waited for the ambulance. It arrived, and the two EMT's (Andrew and Guy) manning the ambulance were equally lovely and had a sense of humor about the whole thing which was greatly appreciated. They treated Clara like a princess and made her ride in the ambulance seem like an adventure instead of something scary. It was my first ride in an ambulance ever, and the two EMT's made it fun and made me feel safe. We pulled into the Emergency Room at Columbia Presbyterian. The ER was backed up and I waited on the gurney in a hallway with a lot of other people waiting on gurneys and in wheelchairs for care. Gerald stood next to me, holding Clara's hand. I soon noticed that all he people around me were acting sorta strange. Well, really strange. The woman across the aisle from me made some funny faces at Clara (normal), then made some slightly obscene faces for my benefit (less normal), then licked the cheek of an unconscious woman sitting beside her who may or may not have been known to her, and told a passing orderly she was in love with him. The EMT's from my ambulance came up to me and said: "Just so you know, everyone else waiting here is high on K2." I told Gerald to get Clara out of there and find my mom and sister - I would let him know where I ended up. 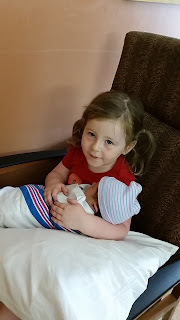 Shortly after Gerald and Clara left, an ER nurse asked what I was doing there, and I was promptly wheeled out of the ER and up to maternity. My water broke at 2:30. At around 6PM I was admitted to Triage and they confirmed my water had broken, but I was only one centimeter dilated. I was having contractions but they weren't really strong. Gerald and I watched Into the Woods on his phone. At around 8pm a labor and delivery room freed up. My first reaction to the room was: Is this a film set? It looked like a staged labor and delivery room in a movie where the laboring mother's hair and makeup remains perfect while a nurse blots her lightly sweating forehead with a cloth handkerchief. The wall-to wall picture window had a sparkling view of downtown Manhattan. In front of the window was a giant sofa that folded out to a bed for Gerald. Our nurse told us that down the hall was a lounge with a fridge stocked with sandwiches and drinks for the dads. AMAZING. At 11pm the on call obstetrician came in to discuss pitocin. After insisting on being checked to see how dilated I was and finding I was still one centimeter, I agreed to start a low dose of pitocin. Contractions enhanced by pitocin are no joke. They felt nothing like my first (drug-free) labor. They were intensely painful and radiated out from my pelvis. 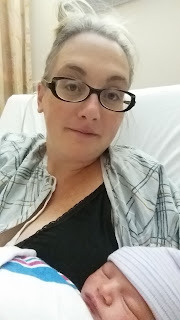 I labored through the hellish pitocin contractions for 4 hours before considering an epidural. On the fence about an epidural I asked the nurse for her advice. She said: "Well, it depends on what your birth plan is. Do you want to feel the worst pain imaginable while giving birth, or not?" "You still have the energy to laugh, you're going to be in labor for a while longer." Welcome to the family, Freya.